The UCF Pharmacy is a state-of-the-art facility located inside the Health Center. 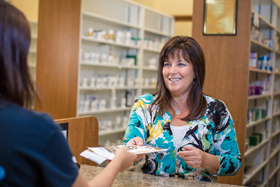 Our Pharmacists are passionate about patient education and providing excellent customer service. Patients are individually counseled and provided written drug information for each prescription. Each prescription is monitored for duplicate therapy, drug allergies, and drug interactions. The pharmacy staff prides itself on the level of care they provide to each patient and the consultation service provided. For more detailed information about the Pharmacy, please visit our Frequently Asked Questions page. Students, faculty, and staff are able to use the UCF Pharmacy for all of their prescription needs. We take over 100 different prescription insurance plans making billing a snap! Refill requests and transferring prescriptions from an outside pharmacy is easy. Use the online forms below, or give us a call! Meet with our Pharmacists for a free consultation about management of your asthma. Topics discussed include medication, triggers, long-term control vs. quick relief and more! To schedule an appointment, please speak with a Pharmacy staff member. Our Pharmacy has a variety of beauty/hygiene items, cleaning supplies, as well as snacks and drinks. Don’t know what you need to alleviate your common cold symptoms? Just pick up one of our $5 flu kits. In it is everything you need to get over the common cold, including a decongestant, antihistamine, Tylenol, throat lozenges, tissues, and even chicken noodle soup! We custom built our First Aid/ Travel kit to cover all the unforeseen circumstances life throws at you. It includes everything from bandages and Tylenol, up to gas and diarrhea relief; all in one convenient UCF zippered pouch! We stock a wide variety of Over the Counter drugs for all your health and well-being needs. We carry brand names as well as more affordable generic options. Bring any unwanted medications to the secure Drug Take Back box located in the UCF Pharmacy or the Student Union. The service is anonymous and accepts everything except liquids and creams. The drugs are then safely disposed of (incinerated).